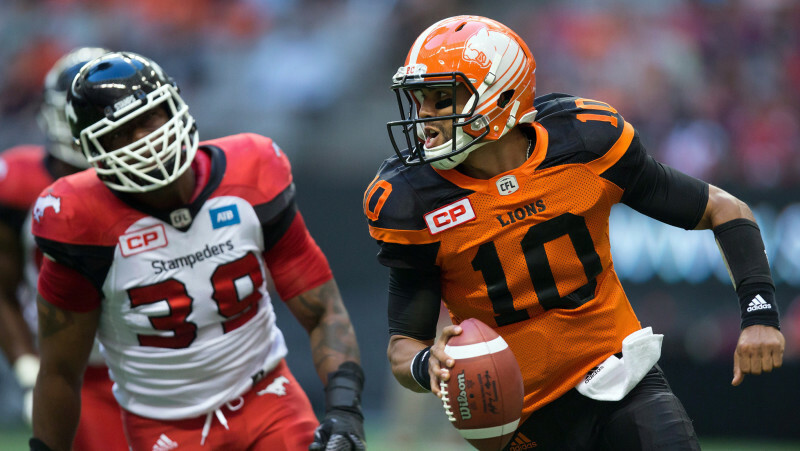 In their final tune-up before Week 1, the Calgary Stampeders evened their pre-season record at 1-1 with a 31-21 win over the Lions at BC Place on Friday night. A touchdown pass from both Bo Levi Mitchell and Drew Tate was enough to give the visitors the edge as they put in their final tune up before they open the season against the same opponent in the same venue a week from now. BC managed to move the chains on their first two plays from scrimmage as the home side marched down the field in short order. Jonathon Jennings then connected with Brian Burnham on a 21-yard touchdown toss before Emmanuel Arceneaux put BC up 8-0 early on following the two-point convert. When the defence returned to the field, a Frank Beltre sack forced a punt from Richie Leone, which was returned 50 yards by Roy Finch of the Stamps. On the ensuing drive, the Stampeders’ Jerome Messam rumbled up the middle for a lengthy pickup before receiving a pass out of the backfield for an 11-yard major. Mitchell would connect with Marquay McDaniel on the following two-point attempt to tie the game at 11-11. Greg Wilson’s second-down reception over the middle kept Calgary’s next possession alive, as did an eventual third-down sneak from Canadian pivot Andrew Buckley. The pair of conversions enabled Paredes to trot on for a 52-yard field goal try and the Venezuelan native split the uprights for a three-point advantage. Just as the second stanza came to a close, Leone was good from 32 yards out, evening up the scoreboard as the teams headed to their respective locker rooms. Taking over for Mitchell to begin the third was Tate, who orchestrated an encouraging drive before throwing an interception in the end zone as the pass found the hands of T.J. Lee instead of DaVaris Daniels. The Lions also substituted for their backup signal caller to start the second half, although Travis Lulay committed a fumble on his initial drop-back. The loose ball was recovered by Ja’Gared Davis and culminated in a 26-yard kick from Paredes to reclaim the lead. A 64-yard catch-and-run by Devonn Brown soon after set up the Leos at Calgary’s two-yard line. Anthony Allen busted through for the subsequent score to put BC ahead by four. Finding space in the back of the end zone at the conclusion of the third frame was Bakari Grant. The former Hamilton Tiger-Cat helped polish off an 11-play series that took 5:27 off the clock. Responding in swift fashion was the combination of Lulay and Stephen Adekolu with the two hooking up for a 45-yard passing play. It then went from bad to worse for the Stamps when Uriah Grant extended BC’s drive upon being flagged for roughing the passer. But the defence ended up limiting the damage, holding the Lions to a 20-yard field goal. Recent signee G.J. Kinne then took reps under centre for the Stampeders, but the QB promptly lost control of the football for the team’s first turnover of the evening. Former Washington Huskie Keith Price would turn it right back over to the visitors when Ciante Evans picked off the CFL rookie. That preceded an impressive snag from Josh Harper and a Paredes field goal from 36 yards out. Before Greg McGee took over for Price, Jamal Nixon’s punt return to just shy of midfield – coupled with Lache Seastrunk’s 10-yard rushing score – secured the win for the Stamps.